Yesterday I park my car downtown, on Franklin, and walk toward Elmwood Park, in a sunlit avenue of saucer magnolias. Saucer magnolias are good trees to be watching this discussion I’m having in my head, about hope, because they’re the most hopeful trees I can think of. They’re the first of all trees to bloom — their pink cupped blossoms opening into clouds, right in the middle of February or early March. We had a saucer magnolia on the southern side of our property when I was a child — I remember its beautiful vase-shaped form and its limber gray branches — and every year my mother lamented that tree’s stubborn determination to blossom in the frost, only to be scorched and frozen and blighted back into brown. It was a brave little tree, to bloom so soon. Maybe more hopeful than it should have been. When I was in Sunday School, as a girl, wearing frilled ankle socks and a gold locket, we memorized Hebrews 11:1: Now faith is the substance of things hoped for, the evidence of things not seen. And it might well be true, that hope, through faith, has actual substance — heft and weight and visible form. Still, sometimes the substance of things hoped for is heavier than we’d like it to be. Hard to carry. I’ll match your Hebrews 11:1 with Proverbs 13:12: Hope deferred makes the heart sick, but desire fulfilled is a tree of life. I have no doubt about that. So. Sometimes hope feels like a pair of wings, and sometimes a pair of shackles. Sometimes dreaming inspires you to open up full and pink-petalled to a February sun, and then the frost comes and the petals fall and that’s the price of your hoping. Sometimes it’s easier not to hope at all. (I’m just being honest with you). On this day, though, I’m feeling hopeful. 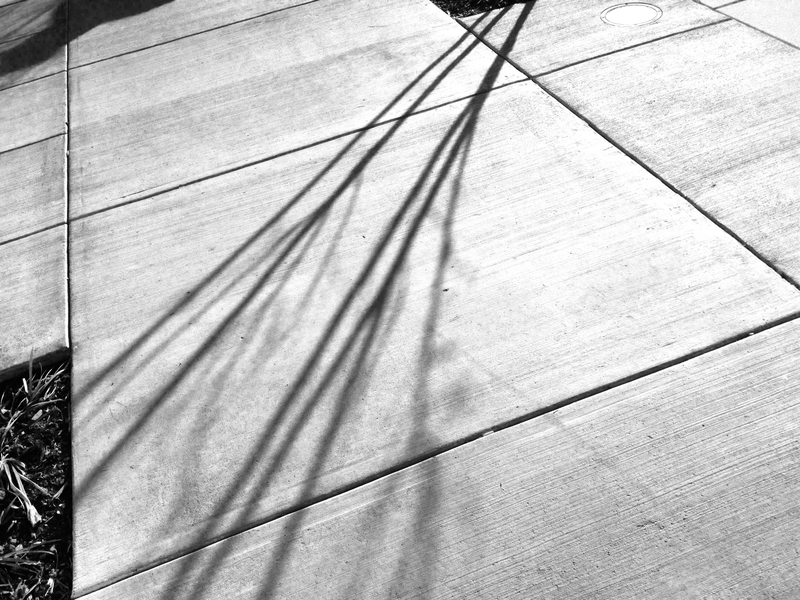 I have seven smooth round stones in the pocket of my coat, and the sun is shining, striping the sidewalk with the shadows of those limber gray branches. There are fat velvet buds on the tips of every magnolia twig, and I’ll tell you, rain’s in the forecast but oh! this sunset-light looks good to me now. And it’s warm. 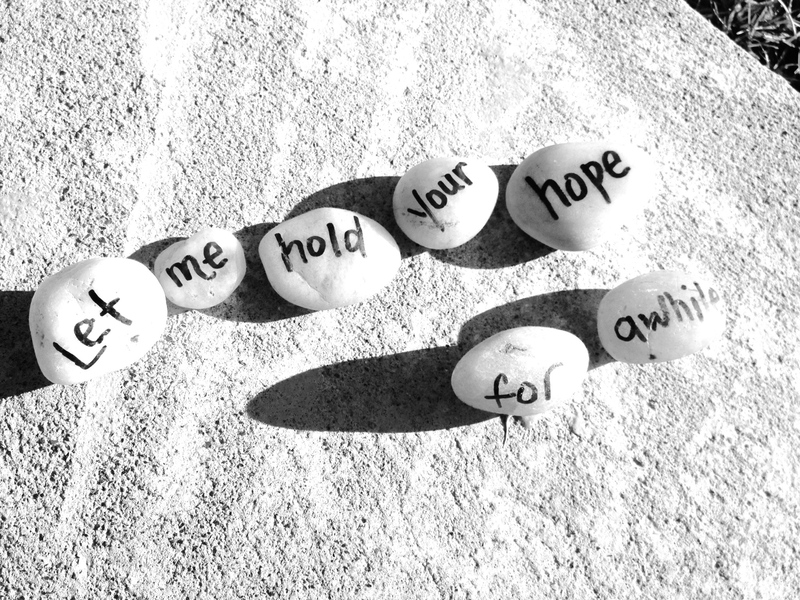 On this day, I have faith enough to carry my own hope, and maybe to carry yours, too. I make my way to the end of the magnolias. Walk into the amphitheater, its grassy terrace nestled against the hillside. I find the right place, just under the ghost-white branches of a sycamore. I sit for awhile in the sun. Disappear the way I came. Oh I SO get that! Some days hope seems so bleak, it all but destroys one’s spirit. And yet, every single time, with intention, hope blooms again in all its glory! I don’t call it ‘hope’ though, I call it my ‘bucket list’ 🙂 I am a visual thinker which means that I can spend glorious moments creating my list (Pinterest is great for that); a list that is always there to come back to when the darkness lifts. If it never happens (which is so much less likely without the dreams), I still had glorious moments creating the list. It is a strange thing, the way the head follows the heart, but if the heart has no dream, the head has nothing to follow. I have lived in 2 homes; both times my heart picked out the desired area, both times my head thought no way. Yep, both times, and without actively searching in those areas, guess where we found ourselves! Both times involved risks our heads would not have allowed, had our hearts not set previous intentions, unbeknown to our conscious selves.